Will the Holy Ghost get a Body? ‘Will the Holy Ghost get a body?’ is a fairly obvious area for speculation. I did a quick search on the ‘nackle and some other likely places but did not find any posts on it. I have to believe it has been discussed before, but I have not seen it. So, for those about to speculate, we salute you. Now wait a minute Eric, this is supposed to be an orthodox blog, how can you speculate on that sort of thing here? I don’t know, this is all new to me. Let me suggest an approach for orthodox speculation. 1 – Pick something that has little to no revelation on it. This topic qualifies. 2 – Make a logical speculation, based on scripture and authoritative sources, about this unknowable topic. We’ll see about that. 3 – See if it violates any area of known doctrine. We’ll see about that also. 4 – Share it in a humble way, making sure everyone knows you are speculating. 5 – Take your lumps in a civil way when people object, and see what you can learn. Be kind. Bruce R. McConkie says in Mormon Doctrine regarding the Holy Ghost, ‘In this dispensation, at least, nothing has been revealed as to his origin or destiny; expressions on these matters are both speculative and fruitless’. But because of this lack of revelation, is it not a ‘safe’ area of speculation? I mention this to show that this topic qualifies under item #1. We will check the fruit, if any, later. We all know from D&C 130:22 that the Holy Ghost does not have a body of flesh and bones, but is a personage of spirit. Also we have from Joseph Smith in Teachings that ‘The Holy Ghost is a personage, and is in the form of a personage’. From this I will make perhaps my first speculative assumption – the Holy Ghost is the same spirit race as Jesus, Lucifer, you, and me. A spirit child of God the Father. This seems reasonably logical to me. I take this for what it says, and make another speculation that the Holy Ghost will not be able to experience a fulness of joy unless he also can have a glorified body of flesh and bones eventually. In connection with this I will add that perhaps bringing to pass the immortality and Eternal Life of the Holy Ghost is included in the work and glory of God. Now for the next leap. I will speculate that the pre-existance was a very, very long period of time where there was the opportunity for substantial progress. A very productive time. Where spirits were able to become noble and great (Abraham 3:22-23) . Perhaps very noble and very great, even like unto God. I will now speculate that while the pre-mortal Jesus said something like, ‘Here am I send me’, perhaps the Holy Ghost volunteered, ‘Here am I, don’t send me’. Thus perhaps selflessly putting off getting a mortal probation in order to serve as the third member of the godhead having progressed to that caliber of being in the pre-existence. I will now guess that getting a body for the Holy Ghost will be a near technicality as it was for Jesus and also apparently children who die before the age of accountability (D&C 137:10). How many levels up am I? I’ve lost track. Now the question is when. It seems the obvious time would be the millennium. Perhaps at the beginning when the wicked are gone and Christ reigns on the earth. Or perhaps near the end, where his absence might be the cause of Satan being loosed for a season. Or maybe somewhere in the middle. The Holy Ghost is the same spirit race as we are. You need a resurrected body to have a fullness of joy, even if you are the Holy Ghost. Part of Gods work and glory is to bring to pass the eternal life of the Holy Ghost. The Holy Ghost progressed to god hood status in a productive pre-existence. The mortal probation of the Holy Ghost (if any) will be a technicality. This speculative mortal probation might take place during the millennium, possibly at the beginning, or at the end, or at the middle. So, does this ladder of speculation lead to any fruit? Did I violate any revealed doctrine? Is this type of approach consistent with the goals of this blog and its intended audience? What do you think of all this? Let me have it. hmmm…I would disagree with that idea and cite the KFD and the subsequent sermon at the grove. We believe that the Godhead is truely God. We believe that the Holy Ghost and the Son are Gods and were Gods before this mortal life. The Son came to earth to work out his Kingdom as did the Father before him. That is to say that the Father was once a savior of a different generation of spirits. My perspective is that if the Holy Ghost is God like Jesus was, premortally, then he will likely be the savior of another spirit generation and work out a kingdom as have all the Gods that have gone before him. Thank you for reding and for your comment. Let me ask a couple of questions if I may. Do you believe that we are literal spirit children of God? Do you believe that Christ is a literal spirit child of God – in fact the first literal spirit child of God? Do you believe that Jesus is our literal spirit brother? And that he is an heir of God and we are joint heirs? If you do not believe these things then I would see why this speculation of mine would not appeal to you very much. I do believe that Christ and the Holy Ghost were God before the earth was created, but that they probably progressed to that state with a very long and productive pre-existence. Oh, and by the way my answer to the above questions is yes to all. We believe that the Godhead is truely God. We believe that the Holy Ghost and the Son are Gods and were Gods before this mortal life. I do believe these things but I don’t think it necessarily follows from these beliefs that there is no such thing as gradations of gods. Indeed, I think scripture makes it quite clear that Christ was not perfect until he had finished his mission here (even though He was a god before he came down). Note: I may not be able to respond to any comments until Sunday night because I’m out of town. hmmmm…I think I see where you are going with those questions, Eric. However, I’m not sure they make a difference. I think we do have a differentce in perspective vis a vis spirit birth (with me taking the KFD as primate and you the latter theological interpolations). That said, I think we both agree that God has had many generations of spirits go through the plan of Salvation and there will yet be more. So I really don’t see how any doctrine of spirit birth contradicts the Joseph Smith teachings on theogeny. Wade, you could even take a McConkie like perspective that says we don’t even worship Jesus and that he isn’t Fully God at all…that would be regretable and fallacious, but you could. There is plenty of scripture in the Pearl of Great Price and the Old Testement that would conclude that he was fully God, despite his lack of expiation at that point in time. The set of three questions was as much for me to try and get a starting point for a discussion on this with you. These thoughts are recent guesses for me and I am just trying them out to see if they are consistent with what we know. The idea of the Holy Ghost and Jesus Christ being literal spirit children of Heavenly Father is pretty central to some of my recent speculative thoughts. If these things are not true then the whole thing crumbles down. From my perspective the Jesus and Holy Ghost as spirit children seems logical and consistent with scripture and current doctrine. BTW, I thought you might hesitate to give simple yes or no answers to my oversimplified questions. I was not trying to be a wise guy, just trying to get a basis for further discussion. Here’s a thought that maybe Elohim was not the actual Savior of his “generation”. What if Elohim “took upon him the name of the/his Savior” of his generaiton, like we are to take upon us the name of Jesus Christ? Truly taking His name upon us is a pre-requisite to entrance into the Celestial kingdom. So if we take upon us the name of Christ, in the fullest sense that Christ means it, then won’t our future first born spirit son (and only begotten in the flesh) in some future universe look upon us and see the savior of _our_ generation? So when Jesus said he only does/did what he saw the Father do, did he “see” what the Father actually did himself, or did he “see” what Elohim’s “elder brother” did because Elohim took upon him the name (in the fullest sense of what it means) of His (Elohim’s) Savior/elder brother? I disagree with J Stapley’s assumption in his last paragraph of his comment of 8:33pm on 3/10. Because, (conditional) promises of godhead are made to us, yet we are not _The_ savior of our generation. Yet I feel confident that if we follow Elohim’s pattern, that our (yours, President Hinckley’s, mine, etc) firstborn in the Spirit will be the savior of our spirit children’s generation. That blows my mind. How will I be able to use the atonement of my firstborn spirit son to forgive billions and billions of my spirit children (hypothetically speaking), if I can’t use the atonement of my elder brother to forgive the sins of a few dozen brothers who’ve offended me in this life? Back to the original question. Yes, I believe the HG is a literal spirit child of Elohim. Therefore I believe he will get a physical body at the end of the Millenium. The Holy Ghost may be the last person to be born on Earth. Those are just my thoughts. Very interesting thoughts. I to have a mind that seeks answers but have learned to let some things go. I believe that we all will one day be blessed to obtain a fullness as Christ has promised. In this life our greatest mission is to preach repentance & bring souls unto Christ. I truly believe we are divinely lead by a Prophet of God & that the only knowledge that really matters is the Doctrine that has been set in concrete as revelation. Nothing in modern revelation has prevented us from seeking answers but some answers we get are for us & not the Church. There are some things I firmly believe to be true but know in my heart that they cannot be taught as doctrine. I do enjoy talking about matters in a open way outside the set bounds but not to establish doctrine just to learn & allow my mind to explore things. The Holy Ghost has a special mission & we know he has a spirit body. The same spirit body we had before we came to Earth. We know that he is a God with divine powers to help us in our mortal probation. I do know that Jesus Christ now has a body of flesh and bones & that our Father in Heaven has a body of flesh & bones. I have a firm faith that our Father in Heaven will grant the Holy Ghost the greatest blessing possible for anybody to receive. If that means a body & other blessings then so be it according to the will of God. We are only mortal beings and can only speculate on these matters. I will always be grateful & thankful & full of praise & thanksgiving unto our Saviour & the Holy Ghost & to our wonderful Father in Heaven for making it all possible. Our mission in this life is to bring souls unto Christ. No amount of knowledge we may gain outside the bounds of that mission will be any benefit to us if we fail to fulfil that mission. We have to subject ourselves to the will of God & teach the doctrine he has confirmed to the world. I am grateful that we have a Prophet to guide the Church & keep the ship steady. I guess that I will always seek to know more things about the whole plan & keep a open mind about all things that I read. The Holy Ghost will always direct me away from those things that are not true. I always remember the wise words of Brigham young. God may reveal to us via revelation answers to questions but we must never try to declare them as Doctrine to Church. Only the Prophet has the power to do that. God bless you all with pure hearts & the ability to learn about sacred things & the wisdom to keep some things to yourself. Another reason I disagree with the idea that the Holy Ghost could be the savior of another spirit generation is that one has to be the _first-born_ spirit of a generation to be the savior of that generation. I think all of us that speculate at some point have to extrapulate on what we feel we know and apply it to what we do not know. Do you have a scriptural basis for the requirement that a savior must be a first born literal spirit child? I also agree that taking the ‘I have done nothing but what I have seen my father do’ statement to be and absolute, complete, every detail, literal thing may be taking it to far. I changed an obvious spelling error that was really bugging me. I also made slight modification to my criteria for speculation list. These changes should have no effect of the comments made so far. Hopefully nobody gets bent out of shape by this re-post. Because, (conditional) promises of godhead are made to us, yet we are not _The_ savior of our generation. I’m familiar with no instance where such promises are extended. Perhaps you conflate the promises of King and Priest? RE: the firstborn. I’m not sure that this is all that important, but if you consider Joseph’s teachings on the nature of Spirit, then perhaps this does not mean what you think it means. But if it does, then perhaps if the Holy Ghost was not resurected in our generation, he would by default be the firstborn of the next. But again, I think it means something else. Wade, you could even take a McConkie like perspective that says we don’t even worship Jesus and that he isn’t Fully God at all…that would be regretable and fallacious, but you could. First, I would be interested to have the sources of your idea that McConkie preached we do not worship Christ! As I recall, McConkie wept during his final conference testimony in which he said he would wash the Savior’s feet with his tears. For some reason, I don’t think your characterization of McConkie’s view is accurate. But, I am interested in seeing what you have to offer. Also, I don’t see why you think I am advocating a position in which we don’t worship Christ as God? I specifically spoke of a gradation of gods, not that we can only worship the Most High God. So, does this ladder of speculation lead to any fruit? Yes, it solidifies the doctrine that we can’t receive a fullness of joy without a body. Did I violate any revealed doctrine? No, it seems that you are only reconciling truths. Is this type of approach consistent with the goals of this blog and its intended audience? What do you think of all this? Let me have it. Thank you for revieweing the interesting statements of the King Follet discourse. It appears from the discourse that perhpas God the Father and Jesus Christ may have some experiences in common that the rest of us might not have. But even if this is the case does it mean that they are really all that different from us? I think my three questions asked above are vital questions. I still believe that you are a literal spirit child of God the Father, and so is Christ, and that you and Christ are literal spirit brothers. Perhaps Christ was able to progress faster than the rest of us, and had some different experiences in the preexistance nad in his mortal life, but that does not mean that we can not become full joint heirs. In fact the oath and covenant promises that all that the father hath might be ours. Oh, I think the thought of the Holy Ghost Possibly getting a chance at getting a body in another generation of spirits, possibly as a savior for the, is an interesting notion. It will take me some time to consider that. Thank you for bringing it in. I think you are right about Elder McConkie. Anyone saying he did not worship the savior is taking things too far in my opinion. Also thanks for your comments on the overall post. We worship the Father and him only and no one else. We do not worship the Son and we do not worship the Holy Ghost. I know perfectly well what the scriptures say about worshipping Christ and Jehovah, but they are speaking in an entirely different sense – the sense of standing in awe and being reverentially grateful to Him who has redeemed us. Worship in the true and saving sense is reserved for God the first, the Creator. I am fully aware of that talk given by McConkie. Yet, I think it is somewhat disingenuous to use that quote out of the context in which it was given. If you research the history of that talk, you’ll find that it was in response to a growing movement on the campus of BYU in which students and ohters were forming worship sessions wherein they would pray to Christ directly. I think if viewed in light of these substantial and growing problems at BYU, it is easier to reconcile the statement that we don’t “worship” Christ with the more broad statement McConkie made in his final address. In other words, in my view it is disingenuous to claim that McConkie didn’t worship Christ. He himself made the distinction between saving worship and other forms. So, what exactly is, as you say, “regretable and fallacious” about what McConkie taught? For me, I think he can be considered one who loved the Lord beyond measure – one who indeed “worshiped” Him. (Sorry, the link I gave last time was wrong – here it is again). After reading that, does anyone honestly believe that McConkie didn’t “worship” Christ? Wade, the context of what was happening at BYU is interesting (especially since the “personal relationship with christ” movement has caught on among current GA’s). Personally, you can consider (spin?) McConkie’s relationship with Christ however you want. I think he bore a powerful testimony of Jesus. At the same time I think his talk on the matter is quite strait forward. He believed that we should only worship God the Father…I believe that is wrong. Simple. Moreover, I think there is significant support against his position. First, I disagree that he didn’t worship Christ. He clearly believed that Christ was “our Lord, our God, and our King”. You may be missing something by jumping to conclusions about his idea of worship though. In reference to worship in the sense of exaltation, it is the Father whom we worship. But it is dubious (and I’m not so naive to claim that McConkie, who was a genius scholar of scripture) to claim that one can worship the Father without ipso facto worshiping the Son!! It is clear that McConkie’s talk (given ONLY at BYU and not to the world as was his conference talk) was seeking to persuade students and others not to leave the Father out of the picture! So, to say he believed in worshiping only the Father is disigenuous in my view. And, assuming arguendo that McConkie was advocating only the worship of the Father what is this other “significant support” against this position that you refer to? Wade, I think it is not disengenuous. McConkie defines the term in the very piece I cite. He states his position clearly. For support for a position against that of McConkie, type in “worship” and “Jesus” in Gospelink or another Church database and you will find literally hundreds of authorities to fit the bill. Sorry for the thread-jack eric. If Jesus had obtained perfection to the extent the Father had before fulfilling the Atonement, why did he say this? Was Christ being dishonest, or should we not take His words as literal as we do McConkie’s? Wade, there is a ton of evidance that shows that Jesus Christ is subordinate to the Father, not least is the KFD that I cited. I fail to see how this reflects on Elder McConkie. You might consider a post on this as you seem to have a fair stake in the elaboration of his doctrine. This is an important discussion. I am not used to this many comments. My whole speculation was mainly based on spirits and bodies needing to be inseperably connected in order to have a fullness of joy and feeling a little sorry for the Holy Ghost and why he should go without. I wanted Him to have a fullness of joy like I hope to have. I was just trying to figure out how he might get one. My guess is just one of many possibilities I suppose, it is the one that makes most sense to me. A lot of this is based on Christ being a literal spirit child of God the Father, and our literal spirit brother, and guessing that the Holy Ghost is also. If we believe that Christ achieved godhood during a productive preexistence then maybe the Holy Ghost could to. It seems to me that the church as a whole believes Christ to be a literal spirit brother to all of us. I think that has become the sticking point for you on this. No sweat, my speculation is just what I felt was a logical guess. You might consider a post on this as you seem to have a fair stake in the elaboration of his doctrine. I think I’ll take you up on this suggestion. I don’t know how soon I’ll get it posted, but it is definitely an interesting topic. It particularly interests me because I had the pleasure of being taught by Elder R. Conrad Schultz of the Second Quorum of Seventy (he was my mission president) concerning these very issues. Also, I feel that McConkie is too often misunderstood and unfortunately dismissed. Above all, I thank you for being civil in your tone and approach even when it may seem I’m being sarcastic etc.! Frankly, I have to agree with Elder McConkie that we don’t Worship Jesus Christ. Having a personal relationship with Christ is equally important and true. To me there is no contradiction; only definitions. When we worship Christ or The Holy Ghost, our worship is directed TOWARD God the Father. They are acting in His name, and that is why we start our prayers (like Jesus taught) Our Father who is in Heaven. They are One God as they are acting under the direction of The God. Anything less shows a lack of understanding of the Godhead. Wade, I’ll look forward to it. Eric, it is not so much a sticking point for me as much as it doesn’t matter so much to me in regards to this topic. I have a different perspective of what “literal spirit offspring” is, but still, there are many generations of spirits and I believe that Jesus was in ther with us (though obviously being very, very different from us). No one’s probably ever going to see this comment, but I wanted to point out that the name of the Church in the Celestial Kingdom is the Church of the Firstborn. The very idea of our worship in heaven is centered around the Christ figure (the name of all saviors past, present, future) as the Firstborn of the Father. I worship Jesus Christ as the Father of the heaven and the earth and all things that in them are just as Abinadi and other Book of Mormon prophets did. 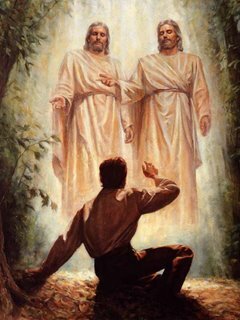 However, I think as a people we sometimes forget that Father Ahman is the President of All, and that Jesus is “merely” his first counselor, the Holy Ghost his second. They have different roles designated to them by Father, but neither is greater than the other, nor are they lesser than Father. I think Brother Stapley has a fundamental and forgivable misunderstanding of the sequences (as Elder Maxwell called them) of the Plan of Salvation, as well as what it means to work out a kingdom with fear and trembling. That is, in fact, what I’m attempting to do and I’m not a member of the godhead. I am a small-c christ, however, as I’m commanded to be in the scriptures. (At least, I’m trying to be.) I think that Bookslinger’s understanding so closely mirrors my own that he’s been reading my journal, or that we were very close in our understanding premortally. Nothing in the scriptures indicates that the Holy Ghost hasn’t already live mortally—only that He’s a spirit at the moment, as we will be in death up until the resurrection. And no, I do not believe Joseph Smith was or is or will be the Holy Ghost. Argh. There should be a *d* after the word live in the third paragraph. Another point to consider: God our Father creates spirit children a part image only of himself. In a patriarchal sense Christ the firstborn spirit became the Saviour and the Holy Ghost the Testifier. The Holy Ghost will receive a body like the rest of us then the his and the Saviours firstborn will have the patriarchal right to do what they have done. The rest of us share in the Fathers inheritance as Kings and Queens etc. The highest order of the Melchizedek Priesthood is patriarchal authority. The order was divinely established with father Adam and mother Eve. They are the fount and progenitors of all living, and they will appear at the culmination of earth’s history at the head of the whole sealed family of the redeemed. The promises given to Abraham and Sarah pertain to this same order. The Godhead have their patriarchal authority. All the spirits born of Elohim will forever worship him as God our Father. The posterity of Christ, the Holy Ghost and those of each of us when we become perfect like our Father will have spirit offspring who will worship Christ as God their Father (grandchildren born in the covenant). Jesus Christ’s firstborn will become the Saviour of our spirit offspring, likewise the Holy Ghost’s firstborn will be their testifier and comforter. Thus we in reality are the spirit grandchildren of Elohim. This I believe is the eternal plan of procreation-eternal increase that has always existed. Thanks for The comment Wayne. Very interesting. Does this mean something of a three track model? A ‘race’ of Saviors, and a ‘race’ of Holy Ghost’s, and a ‘race’ of others? I am not quite sure I buy it, but it is an interesting take. PATRIARCHAL ORDER: FROM ADAM TO MOSES. The order of this priesthood which was established in the beginning was patriarchal. The authority descended from father to son, and those who held it were high priests. This order of descent from Adam to Noah is given in the Doctrine and Covenants. Noah, who stands next to Adam in authority, brought this priesthood through the flood, and it continued from generation to generation. Abraham, the 10th from Noah, received special blessings from the Lord, and the priesthood continued through him and his seed with the promise that all who received the gospel should be counted as Abraham’s seed and partake of his blessings. The rights to patriarchal priesthood authority is the key to understanding why you and I will not be a Saviour like Jesus Christ or be the Holy Ghost. It is an eternal right as perenial as the priesthood, although as Gods we can create worlds and have posterity without end. As Gods will each of our firstborn spirits be a Saviour? Please think that through…….. I am not quite buying this. Priesthood authority is more than mere genealogy. elvis has left the building ! the holy ghost must at some point get a body , and another will take his place! Yes, God had already chosen a body for the Holy Spirit. If you read the following – When the day of Pentecost had come they were all together in one place. And suddenly a sound came from heaven like the rush of a mighty wind, and it filled all the house where they were sitting. And there appeared to them tongues as of fire, distributed as resting upon each one of them. And they were all filled with the Holy Spirit…(Acts 2:1-4). If Jesus Christ was the first to come from the Godhead and the Holy Ghost the second as we read in Acts, What [if] the Holy Ghost was being spoken of to come in the latter-days in mortality as an Elias before the Bride Groom? NOTE: this is [not] doctrine, this is open for discussion. Mark Fultz I am with you on that; however, Father’s personal Spirit and Christ can as well being part of the Godhead? Steve Anderson It is important to remember that theories concerning the origin or destiny of the Holy Ghost are pure speculation. The Standard Works are silent on both topics. Maryann Taylor Why speculate about something for which there is no doctrinal foundation? Franklin Reid There is plenty of doctrinal foundation for the “first shall be last” etc. L Tom Perry told me that God Chooses his Prophets, They don’t. It was actually a good experience. I testify to you that I both saw and embraced the Father and the Son at that point and am a Witness to both the Father and the Son. Another was there who saw these things as well. We are both doing work in north america at this time. Food for thought, perhaps he has already received a body, and is currently a spirit waiting to be resurrected during the Millennium when Satan is bound. Just an area for thought. May or may not be true. Not like my salvation depends on it or anything. Would that violate D&C 130?